The links between antioxidants and vision health are strong. Antioxidants are the antidote to oxidization. Normal metabolism creates free radicals. These are atoms that lack an electron. 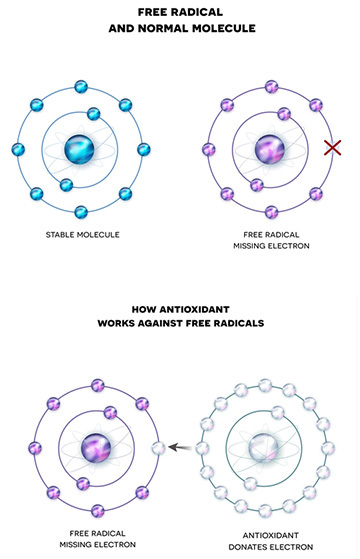 Free radicals roam about the body, scavenging electrons and stealing electrons from healthy cells. This results in permanent damage to these afflicted cells which ultimately can result in disease. Significant research has shown that antioxidants protect against this cellular damage and are essential for maintaining health. The eye is especially vulnerable to free radical damage. Therefore, providing the body with sufficient antioxidants helps prevent eye disease and maintain healthy vision. Doctors and eye care professionals often overlook the power of antioxidants, despite the many peer-reviewed research studies confirming the essential need of antioxidants for eye and overall health. Oxidative stress is an imbalance of free radicals versus antioxidants in the body. You can take simple steps to increase the amounts of antioxidants available in your system. Your body can manufacture certain antioxidants if given the right building blocks. Glutathione, Alpha Lipoic Acid, CoQ10 and vitamin D can be made in the body. Other antioxidants must be ingested, including resveratrol, carotenoids, Astaxanthin, Lutein, Zeaxanthin, Vitamin C, and Vitamin E for example. Why is Glutathione called a super-antioxidant? This substance can neutralize the full range of free radicals. Few other antioxidants can do this. Low levels of glutathione are linked to cataracts and macular degeneration, and other age-related diseases. Our body manufactures glutathione; however, it is limited by the rarity of cysteine in our diets. Cysteine is a required amino acid in glutathione production. The best dietary sources of cysteine are from cruciferous vegetables: broccoli, Brussels sprouts, cabbage, kale, bok choy, etc. Supplements may be needed. Pills and capsules are poorly absorbed. A mouth spray such as ACG Glutathione Extra Strength Spray is more easily absorbed. Other co-factors that help the liver produce more glutathione include amino acids glycine and glutamine, along with alpha lipoic acid, selenium, and vitamin C.
Lipoic acid is not considered an essential nutrient, but it is a powerful antioxidant. It converts glucose into energy. ALA appears to have a direct effect on ocular tissue metabolism.4 Food contains it, but only in very small amounts and not readily usable. Supplementation options include Alpha Lipoic Acid: 100 mg and Alpha Lipoic Acid: 300 mg.
Coenzyme Q10 supports all cellular activity and heart health. Healthy individuals naturally produce sufficient CoQ10. However, deficiency can be caused by a genetic flaw, or side effects from statin drugs, or other reasons. Some doctors routinely prescribe CoQ10 for statin drug users. If tests reveal a deficiency, supplementation is needed. Natural Eye Care has CoQ10 & L-Carnitine 60 softgels – the L-Carnitine supports the CoQ10. Your body can manufacture vitamin D from sufficient sun exposure. However, people in northern climates or who spend almost all their time indoors may not get enough. Milk is fortified with Vitamin D to help with calcium absorption, but this may not be enough. Vitamin D deficiency is common, particularly in seniors. A simple blood test determines if supplementation is needed. We recommend Vitamin D3 which is the most absorbable form of D.
One delicious antioxidant is resveratrol. This nutrient is found in blueberries, raspberries, mulberries, lingonberry, Senna, and the skin of grapes. Think red wine, dark grape juice, and bowls of berries. Resveratrol has neuroprotective properties. For supplementation, try Resveratrol Ultra High Potency. Brightly colored fruits and vegetables are beautiful to behold — they are also crucial to eye health. Carotenoids are a class of antioxidants that includes beta-carotene, astaxanthin, zeaxanthin, lycopene and lutein. The eyes require relatively large amounts of carotenoids for health vision maintenance. The macula gets its yellow color from zeaxanthin and lutein, which protects it from damage to due exposure to Ultra Violet and blue light from sunlight. A diet rich in a wide variety of colored produce nourishes the eyes and helps prevent eye disease. However, diseases such as macular degeneration are particularly prevalent in seniors, particularly due to poorer ability to digest and absorb nutrients from food and poorer circulation. Other factors include effects of medications, health issues and often a more sedentary lifestyle. Careful attention to diet plus targeted supplementation and regular exercise can help ward off eye disease, especially as one ages. If eye disease sets in, Natural Eye Care offers packages based on the disease that provides targeted supplementation, including specific carotenoids. One of the biggest concentrations of vitamin C is in the eye. Vitamin C enhances lutein absorption, which is important for preventing macular degeneration. It reduces inflammation; swelling and inflammation which are prevalent in uveitis patients. Vitamin C somewhat lowers intraocular pressure (glaucoma). Vitamin C is a precursor in glutathione production and helps prevent oxidation. It reduces oxidative stress that contributes to cataract formation. Vitamin C also supports connective tissue health (vitreous detachment). While most other mammals can manufacture this nutrient, humans cannot. A diet rich in various fruits and vegetables will have plenty of Vitamin C. Otherwise, supplementation is recommended. A major fat-soluble vitamin, Vitamin E neutralizes free radicals. It also helps eliminate toxins, treats hardening of the arteries and enhances brain functioning. The Standard American Diet (SAD) does not provide sufficient amounts of antioxidants. The Mediterranean Diet is an example of an excellent diet that contains more fruits and vegetables, and better fats (primarily high-quality olive oil). Sensible supplementation means looking first at the diet. Is there a way to get sufficient amounts of antioxidants from food? See our article on food sources of antioxidants. Keep a food log and compare nutrient intake to recommendations. Supplement to achieve optimal nutrient levels. If you are already suffering from an eye condition, you may need more of the related nutrient. Purchase from a local store, or order supplements online. Natural Eye Care offers free phone consultations by phone and email. We can help you choose any needed supplements based on your age, gender, and any eye conditions you may have been diagnosed with by your eye doctor. Smoking tobacco causes oxidization. Antioxidants help scavenge free radicals from normal metabolic processes. Smoking adds to this load. Smokers need additional antioxidants, especially Vitamin C. Ideally, stop smoking. See our Smoker’s Life infographic. The eyes have one of the highest concentrations of nutrients in the body. Certain antioxidants are building blocks for parts of the eye’s anatomy. Research has shown that certain antioxidants are especially good at addressing free radicals in the eyes. Eat a nutritious diet and supplement to provide more antioxidants. Oxidative stress is implicated in many eye diseases. Finding a balance between free radicals and antioxidants reduces oxidative stress. Low oxidative stress helps prevent eye disease.